The number of out-of-state students planning to attend UMaine’s flagship campus in Orono has skyrocketed. A record number of out-of-state students, including hundreds from Massachusetts, will be attending the University of Maine’s flagship campus in Orono this fall after the college slashed tuition prices for new students. Under the new Flagship Match program, qualifying students from Massachusetts, New Hampshire, Vermont, Connecticut, New Jersey, and Pennsylvania will pay the same tuition and fees at U-Maine in Orono as they would at their home state’s flagship institution. A Massachusetts student, for example, would pay the in-state University of Massachusetts Amherst price of $14,141 instead of UMaine’s out-of-state rate of $28,880, based on this year’s costs. As of May 1, 2,447 first-year students had committed to attending UMaine in the fall, compared to 2,012 at this time last year, for a 22 percent increase. Of those, about 45 percent, or 1,123, are out-of-state students, compared to 35 percent, or 731 students last year. The University of Maine, in a first for a New England flagship campus, will be slashing tuition for students from Massachusetts and other Northeastern states as it tries to combat dwindling revenue and enrollment. The number of students from Massachusetts planning to attend UMaine has skyrocketed, going from 286 at this time last year to 518, for an 81 percent increase. Brockton resident Dan Devine, a senior at Catholic Memorial School in West Roxbury, said Flagship Match is the reason he chose UMaine. Devine said he was drawn to the school for its rugby program but couldn’t afford the full tuition. After the rugby coach told him about Flagship Match, it was an easy decision. UMaine also saw gains from other states targeted by Flagship Match. The number of students from Connecticut went from 92 to 122; New Hampshire, 73 to 103; New Jersey, 52 to 71; Vermont, 32 to 39; and Pennsylvania, 23 to 31. UMaine’s awards are divided into two categories. To qualify for a full flagship match at UMaine, students must have both a high school GPA of at least 3.0 and SAT scores of 1,050 or higher. Accepted students who do not meet the criteria will qualify for a smaller award of $9,000. Over the next eight years, the number of high school students in the Northeast is expected to shrink by more than 5 percent, tightening the competition for applicants. To keep enrollments up and money coming in, UMaine introduced the program as a way to attract more students from out of state. It appears to have been a success, officials said. Hecker said the university’s fiscal-year budget was based upon a class of 2,200 students, including about 40 percent from out of state. “Our preliminary numbers suggest that the entering class will be larger than expected, with a higher out-of-state percentage, which is good news for UMaine’s bottom line,’’ he said. He added that increasing enrollment of out-of-state students is good for Maine’s economy, as well. Not only did more students apply this year, but the number of juniors inquiring about the school has jumped dramatically, Hecker said. In the 2014-15 school year, 3,858 juniors from Massachusetts requested information about UMaine, compared to 7,201 juniors this school year, he said. Interest is also up at other New England public universities, though enrollment numbers are not yet available. The University of New Hampshire received more than 20,000 first-year applications to attend the flagship campus in Durham this year, an increase of nearly 1,000 from last year and an all-time record. 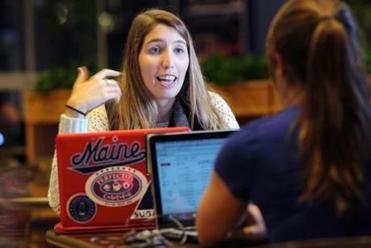 UMass Amherst also received a record number of applications — up about 903 from last year to 40,913. “We’re confident we will have a strong year and continue to recruit outstanding students,’’ said UMass spokesman Edward Blaguszewski. UMaine’s Flagship Match program appears to be unique, but other schools are taking steps to make college more affordable. 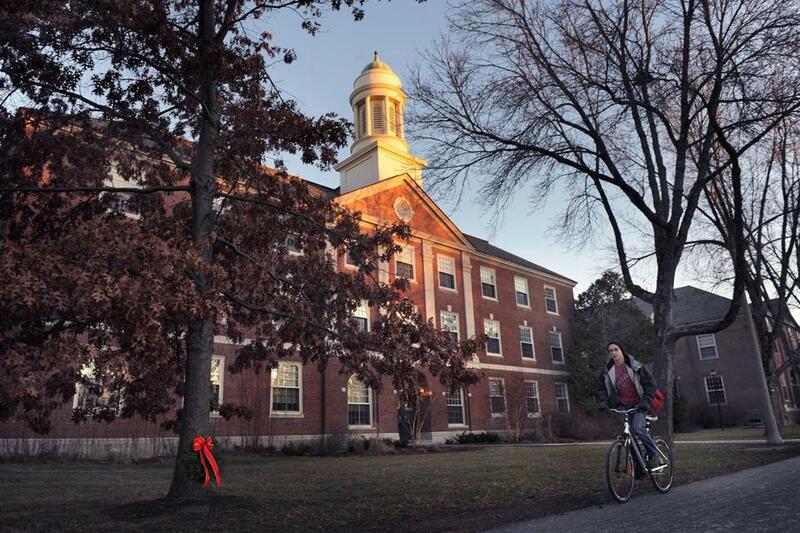 Massachusetts recently launched the Commonwealth Commitment program, which will offer tuition rebates to qualifying community college students who graduate within 2½ years and move on to a public state college or university. Jennifer Fenn Lefferts can be reached at jflefferts@yahoo.com.